Maxine Peake, Joanna Lumley, Stephen Fry and Moby are among the stars who will appear at this year's Hay Festival in Powys. Festival director Peter Florence said the event was "a space to think, and to think again". Stephen Fry, who is also the festival's president, will discuss his books Mythos and Heroes. 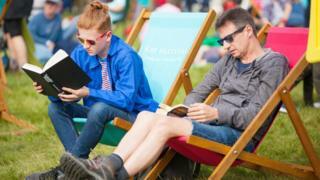 It is one of the world's leading book festivals, and its programme includes stand-up comedy and music alongside traditional talks by authors. Mr Florence said: "Hay Festival is a space to think, and to think again, and to put the great issues of the day in a context of global history. "Empires fall, technology empowers and enslaves us, faiths are shaken, orthodoxies disrupted and still we come together and talk and sing and dance, break bread and tell stories." There are also milestones of note in children's books, with 20 years of The Gruffalo marked with an appearance by author Julia Donaldson.